Today was a Hot Dog Day. 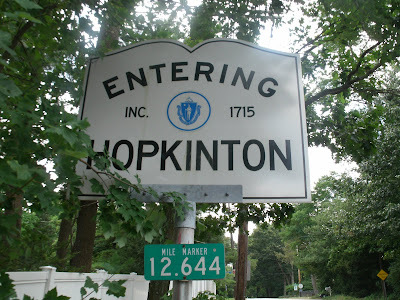 So I decided to take a ride out to Hopkinton, Massachusetts. Hopkinton is best known for being the starting place for the Boston Marathon. 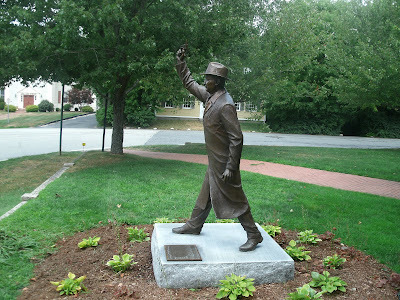 On this day, I was searching for something else that might make Hopkinton famous. 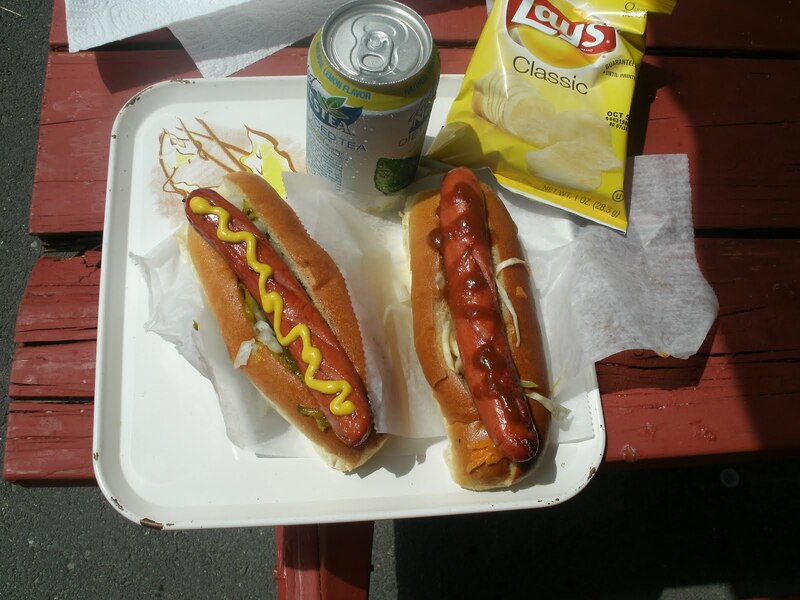 Tucked in a corner of the parking lot behind Colella’s Market is one of the newest destinations on the local hot dog scene…. 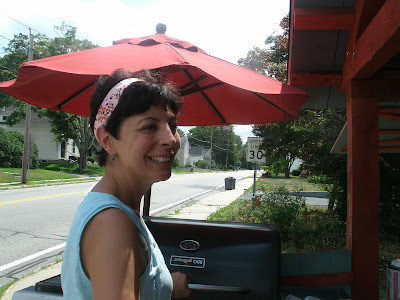 Snappy Dogs is the result of collaboration between partners Lisa Volpe-Hachey (pictured below) and Theresa Boyce (on vacation the day I went). 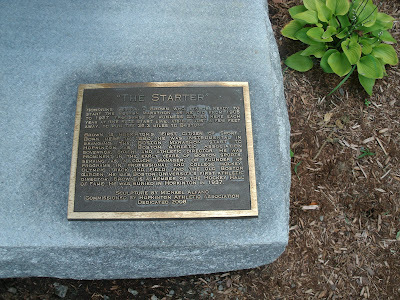 The two partners worked together for five years in 3 different local restaurants, all of which closed down. Lisa, a classically trained chef who attended Le Cordon Bleu College of Culinary Arts in Boston, worked as a chef in the various kitchens and Theresa worked the “front of the house.” Frustrated by the constant job changes, Lisa went for a ride one day last June and had an epiphany when she saw a little hot dog truck out near the Quabbin reservoir. She got on the phone to her friend and future partner, Theresa, and said, “we can do this!” Between June and September of 2009, the two built their trailer, got all their permits and secured a location. These gals work fast! 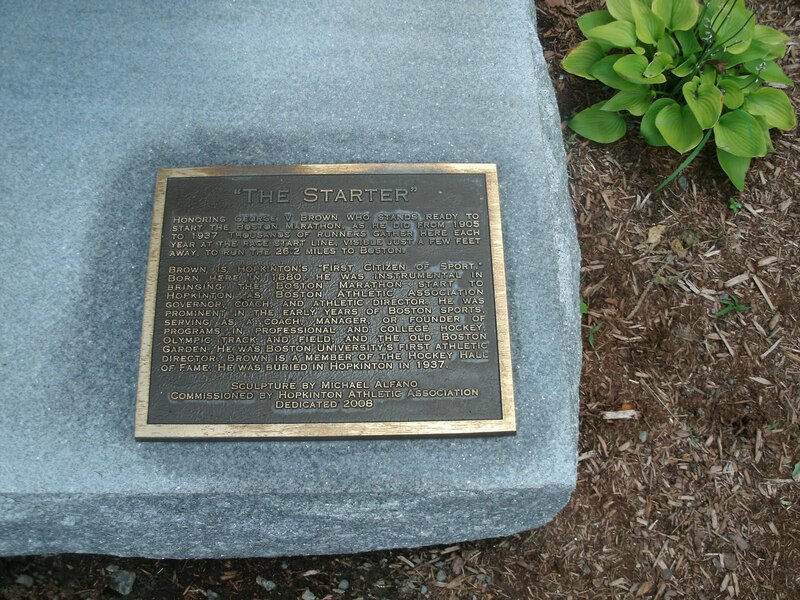 Thus Snappy Dogs was born. (That’s Lisa’s daughter above helping out while Theresa is on vacation). 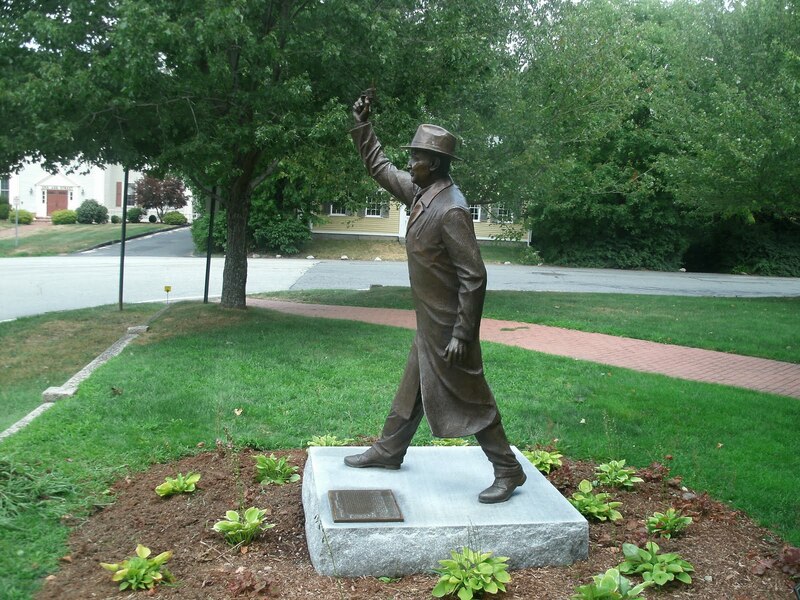 Lisa’s dad, Tony Volpe, (below) was hanging around and told me about his involvement with the Northborough Area Community Chorus. He thinks his daughter ought to franchise the Snappy Dogs concept. One thing that makes Snappy Dogs unique is they are one of two (known) solar powered hot dog carts in the US. 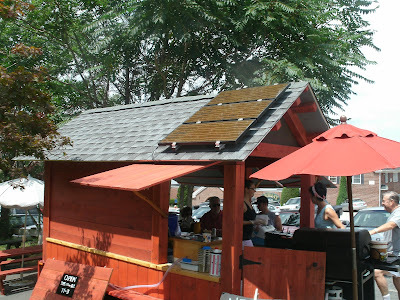 The other one is Sergey Popov’s Solar Powered Hot Dog Cart in Denver. 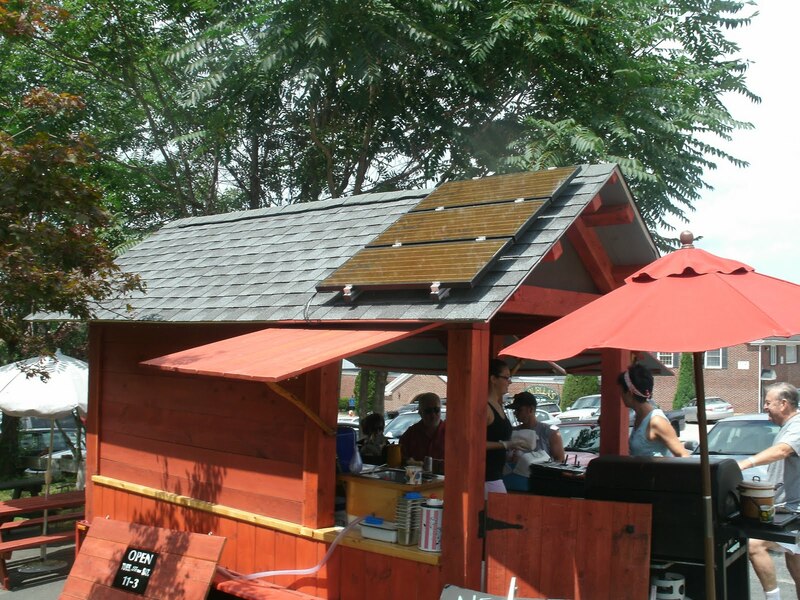 The solar panels operate all electrical components at Snappy Dogs: the water heater and pump and the lights. 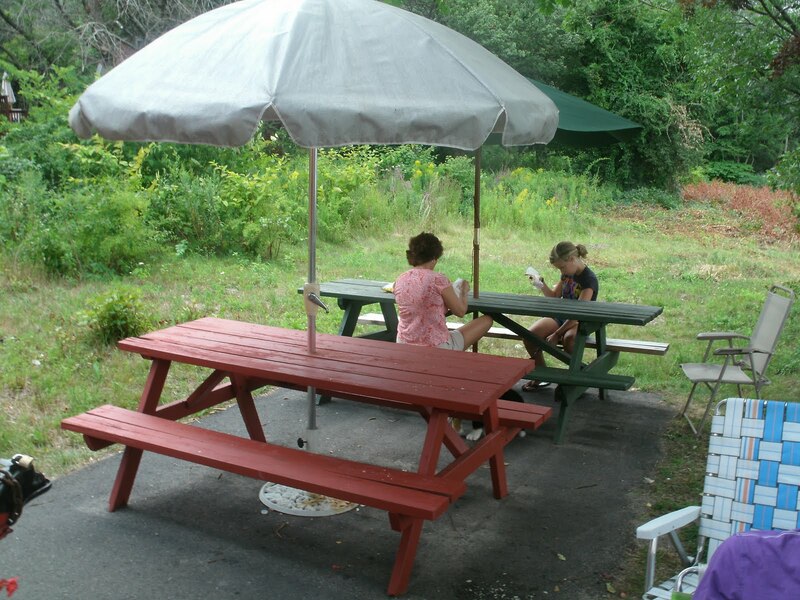 Another feature about Snappy Dogs is the trailer is “homemade.” The gals bought a landscape trailer, framed it, added counter tops, a sink and VOILA, the Snappy Dog stand was good to go. The trailer is pretty bare bones as far as kitchen equipment goes. 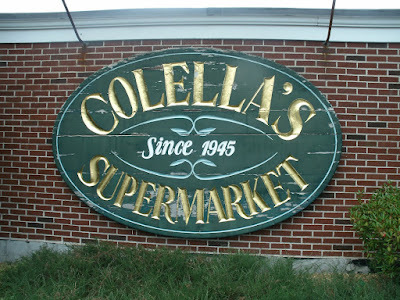 They have the luxury of using the kitchen and the walk in freezer at Colella’s Market for prep work and storage. Colella’s also bakes their hot dog buns for them fresh daily. You can see pictures of how they made their own hot dog trailer on their website. Lisa didn’t share any construction drawings with me, but from the looks of things, anyone with a little know how can build a hot dog cart. 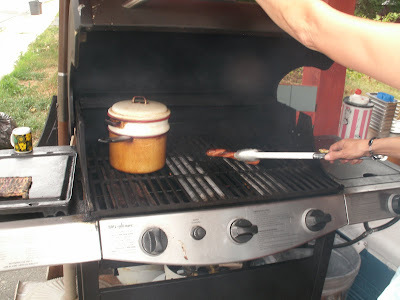 At Snappy Dogs, they grill a Pearl natural casing frankfurter to order. 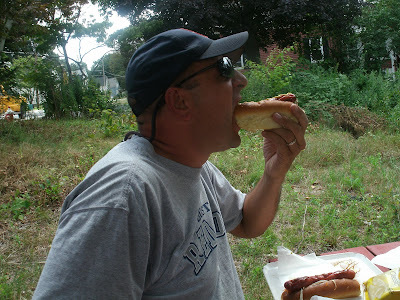 Pearls are good grilling dogs-the Kayhems I used to serve on the Hot Dog Truck were better suited to steaming. The real treat at Snappy Dogs, besides the fresh baked buns, is the homemade toppings. I dressed up two buns while I waited for my dogs to cook-one with the zucchini relish and onions (to be topped with yellow mustard) and one with spicy slaw and onions (to be topped with Dr. Pepper BBQ sauce). All the toppings at Snappy Dogs are homemade; they have zucchini relish, cranberry relish, rhubarb chutney, spicy slaw, green tomato relish, chipotle ketchup, wasabi mayo, and Dr. Pepper bbq sauce. Of course, they have the traditional ketchup, mustard, onions, and relish. 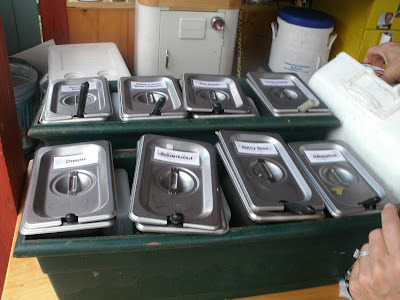 Lisa is planning on bottling some of her homemade toppings for retail sale-watch here for any news on that front. This dog (not mine) has zucchini relish and homemade rhubarb dijon mustard on it-yum! Here’s my dogs all dressed (that’s not ketchup on that dog, it’s Dr. Pepper BBQ sauce). A bag of Lay’s Chips and an Ice Tea and I was good to go. I surveyed the dining room, found a seat, and chowed down. 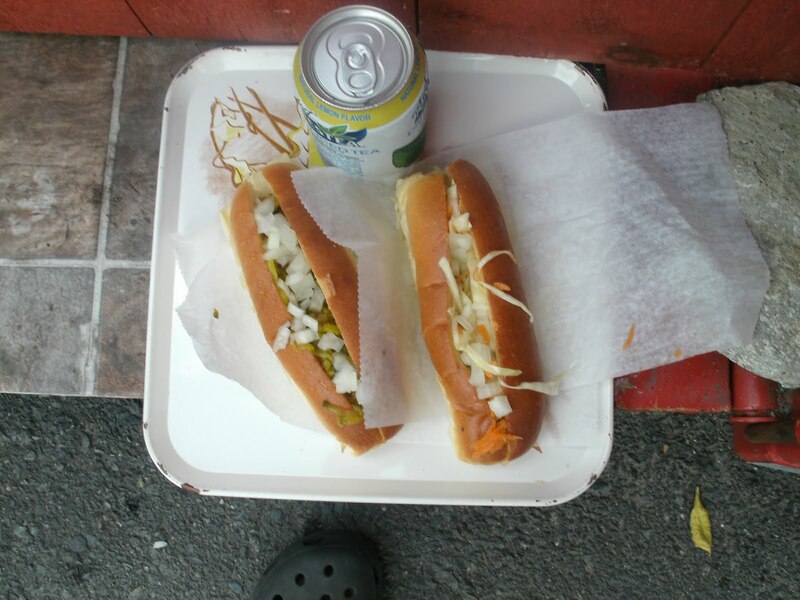 The combination of the fresh baked roll, grilled dog and zucchini relish was a true hot dog lover’s delicacy. I’m big on grilled buns, but fresh baked bread is it’s own little taste of heaven. 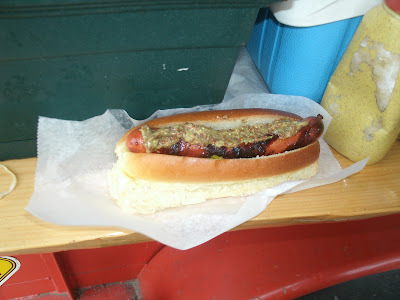 The dog with the spicy slaw and Dr. Pepper Sauce was just the right balance of spiciness and tanginess. I’d order both again. The menu is simple. 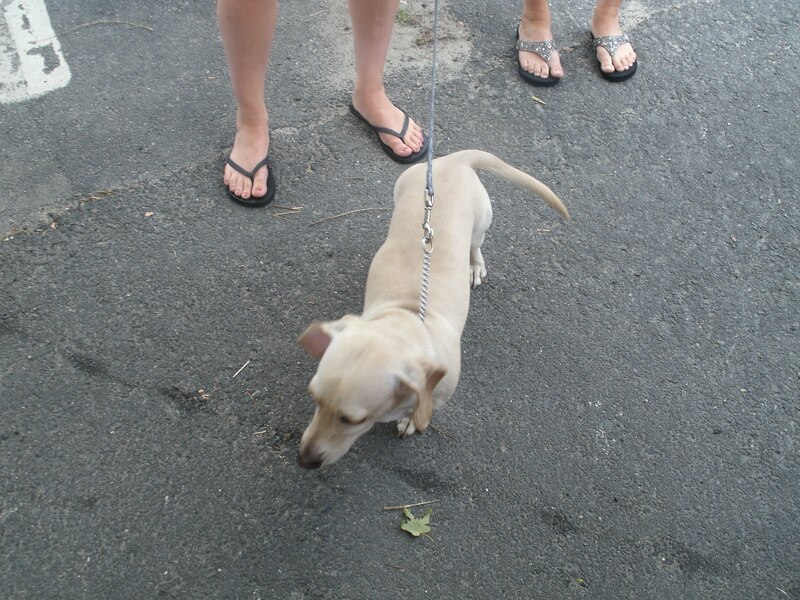 You can order Big Dogs, Little Dogs (mine were the little dogs) or Turkey Dogs. They have a good selection of soda (even Moxie) and chips and homemade desserts. 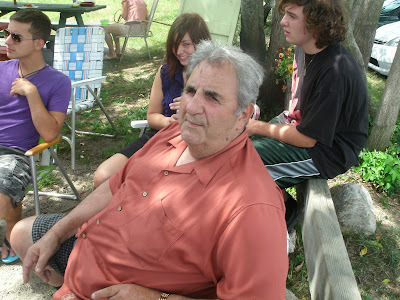 But seriously folks, this is a good hot dog story. 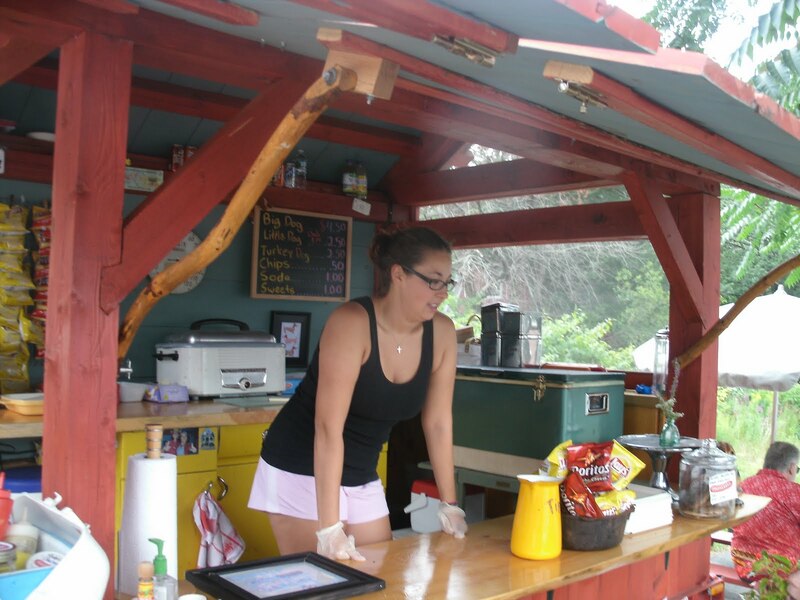 These two ladies had a dream to start a hot dog business and they went out and did it up right. Judging from the steady stream of customers, they’ll be here for quite a while. 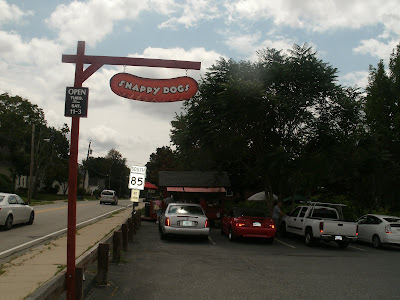 If you are ever in Hopkinton, make sure you stop in for a Snappy Dog, just don’t have one BEFORE you run the Marathon.